I’ve been making collages ever since I was a kid. My first collage was made back when I was in middle school. Then for a few years, I continued to experiment with the medium. 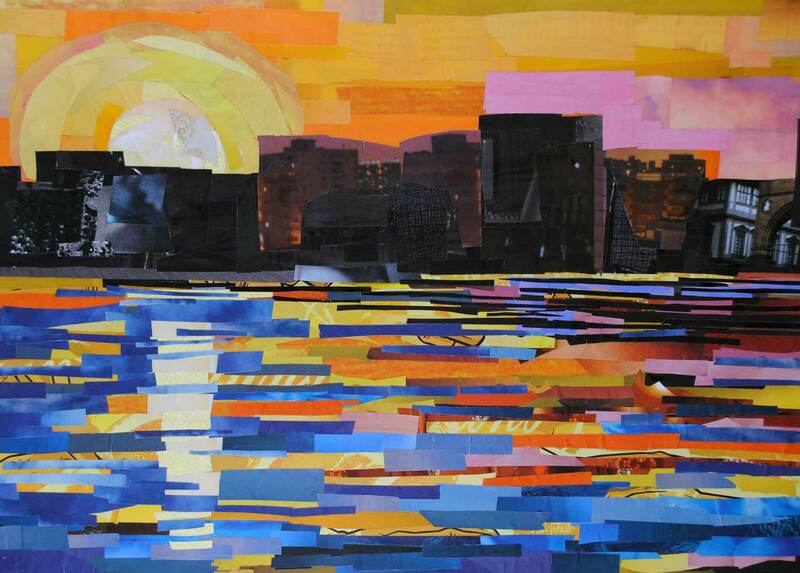 I had a tendency of working in a number of mediums and collage was simply another area I explored. By the time I was a senior in high school, I started exploring the process of cutting magazine strips while focusing on color and texture. 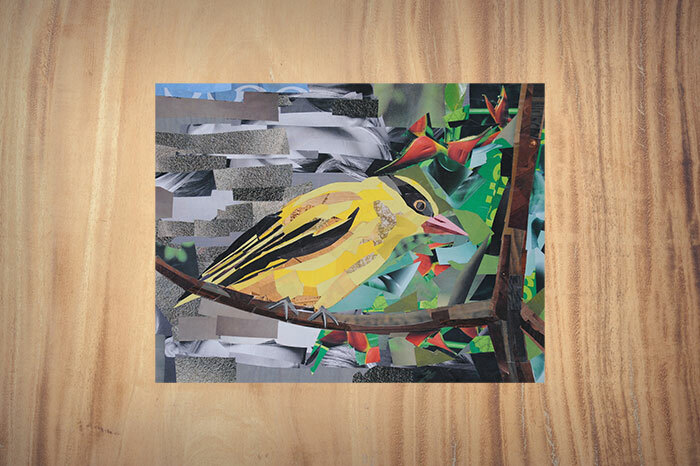 Before then, my collages looked a lot more like what you think of when you think of traditional collage – where it’s obvious that the work of art was made from fragments of photographs. 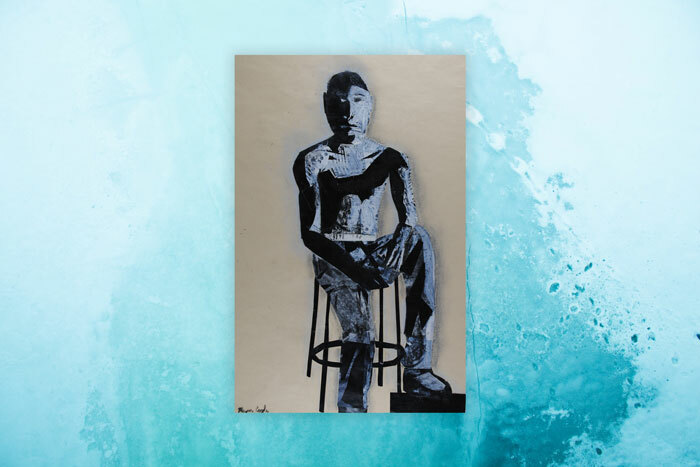 My last year in high school was when I started painting with paper, where I manipulated paper in such a way that it mimicked the brushstrokes of a painting. I also had a habit of incorporating oil pastel with my collages, until a peer asked me why I was covering up all my hard work by drawing on top of it. When I realized I didn’t have a good answer for her, I decided I should focus on making collages entirely from paper. My senior thesis exhibition was my first cohesive body of work that was made entirely from paper. And since then, I’ve continued to hone and explore my craft. I have no idea how my art will evolve in the next ten years, and to me, that’s pretty exciting. I’m looking forward to my future artistic adventures. 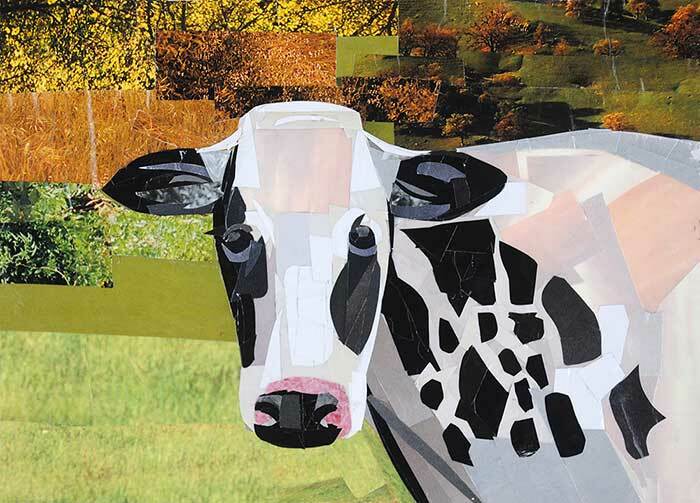 Back when I was a senior in college, I created my first cohesive body of collage work where I made collages entirely from magazine strips. My senior thesis exhibition included a series of portraits, with several inspired by my family. At that time, I wasn’t interested in making portraits of famous or well-known figures, but figures that were well-known to me. The image above is a collage, “Bill,” that was inspired by my father. I had taken a series of photographs of him and ended up working from a few reference images in order to complete his portrait. 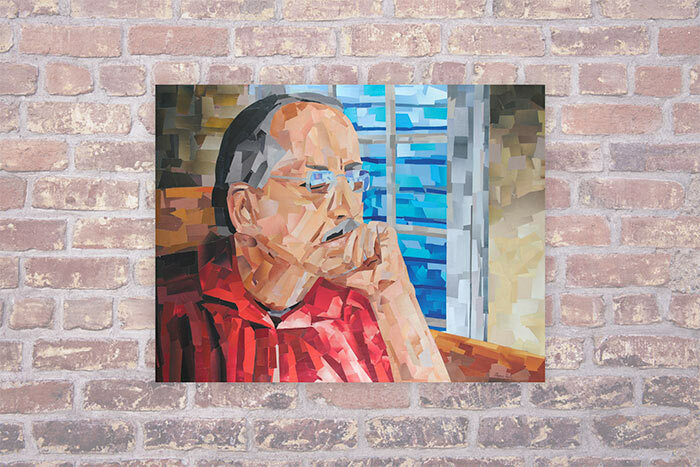 I wanted to make a portrait of my father because I’ve really appreciated how he’s influenced my interest in art. When I was a kid, I remember that he used to paint landscapes and still life scenes when we went on vacation. And over the years, he’s been an avid photographer. “Jean” is a portrait of my mother that was also part of my senior thesis exhibit. I remember that my mother’s portrait was a bit of a challenge because of all the details involved with the background – the windows, the bookshelf, the faint hint of color variation for the blinds, and of course, the detail of her shirt. Over the years, she’s worn many hats, one of which I’d like to think of as her counselor hat, being helpful in giving me advice in life. She seems a bit serious in this portrait, almost as though she’s about to impart some advice. “Bren” is a portrait of my brother. I’m realizing that he’s appeared in several of my figurative collages over the years. What can I say? My brother has always had a tendency of being great at making expressive faces. He is also pretty artistic, and growing up, I was inspired by the artwork he made. He studied animation back in college, and currently works as an animator/3d artist. “Ali” is a portrait of my cousin, who I like to say seems more like a sister to me than a cousin, simply because we spent so much time together when we were growing up. Like my brother, I feel like she can be pretty expressive, and she’s appeared in a couple of my portraits. “Scott” is a portrait of my cousin who passed away back when I was in high school. When I was in college, I really wanted to create a work of art in memory of him. I remember that I struggled with this portrait, since I really wanted to make sure I could capture his likeness. This portrait was also part of my senior thesis exhibition. After college, I started exploring different ways of tackling portraiture. “Boy with Dog” was one of my first pieces that looked at portraiture involving a person and a pet. This piece was also inspired by one of my younger cousins, Drew. Later, I started creating images where figures were interacting more with their surroundings. “Sightseers” is a piece that was inspired by my mother and brother when we were on the rooftop of a building in New York City, admiring the view. For several years, my family went to West Virginia for Thanksgiving. We’d rent a cabin, and it usually snowed at some point during our stay. “The Hikers” is inspired by the walks I’d occasionally take with my family in the snow. For this piece, I explored using more abstract shapes, as well as fragments from photographs of nature. Growing up, my family spent a few summers in Maine. Sometimes my brother and I would go snorkeling in the ocean, and since the water was always so cold, we’d wear wetsuits. 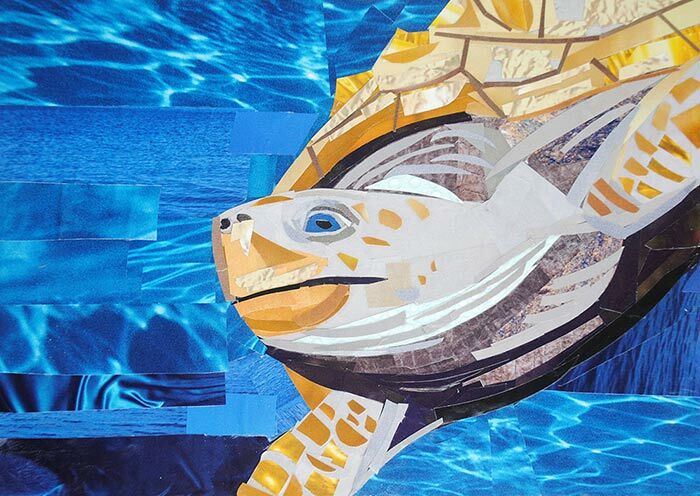 “Snorkeling” was inspired by those summers spent snorkeling and exploring tide pools. I have my family to thank for inspiring a lot of my earlier portraiture work. 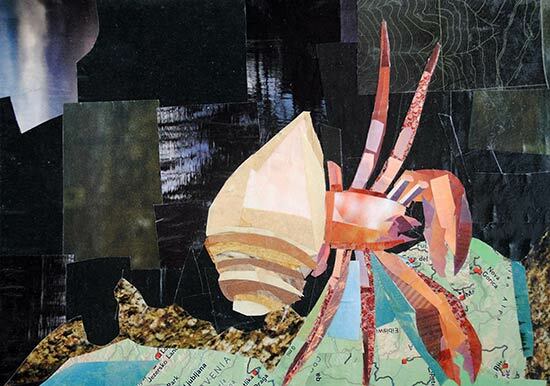 I actually haven’t explored figurative collages in a while, and I suppose you could say I’m well overdue for that. Perhaps I should turn to my family and friends again, and see how they can help inspire future works of art. The first version of my portfolio site looked pretty terrible, but I was so proud that I figured out how to make it all on my own. I also liked how building the website was an art of its own. Above you can see that I made the header and navigational links collaged images. I later learned that using images for navigation isn’t very user-friendly, so I converted the navigation to text. Aside from teaching myself to code, and continuing to read articles on the subject, I also started taking classes in graphic design. I was hungry to make my website better, but I also wanted to make it look better too. I ended up creating a logo for my site, which you can see above. I suppose I was pretty proud that I designed the logo all on my own, that initially it was rather large in the header. For the next version of my site, I realized I needed to shrink the logo down more, and I started featuring more images of my work on the homepage. Once I had a better handle on the basic look and feel, I started building it out more. In 2010, I put together an educational section with online lesson plans, since I noticed that students and teachers were contacting me every year with questions about my work. I wanted to make it easier for others to learn about my process and technique. 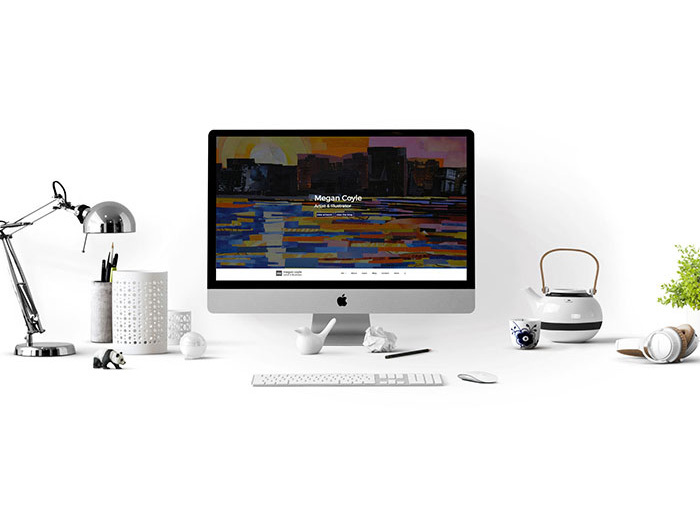 I continued to play around with the overall look and feel, as well as making improvements to the user experience, like making the website responsive. 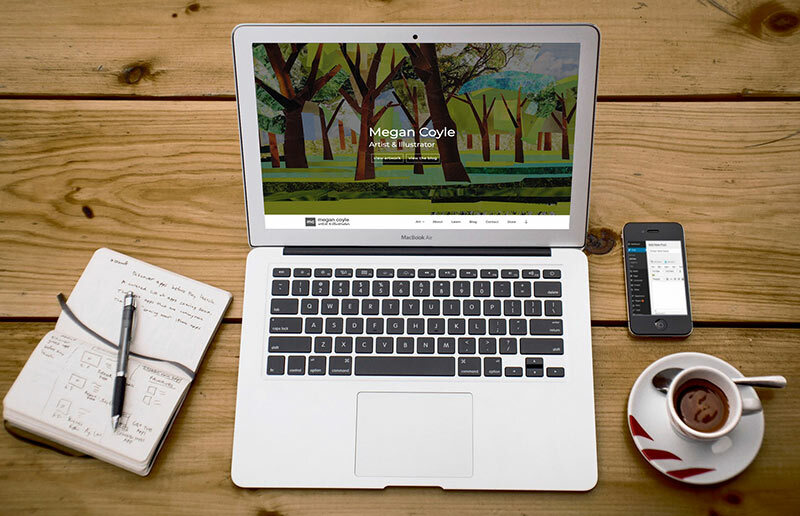 Earlier this year, I worked on redesigning my site once more. 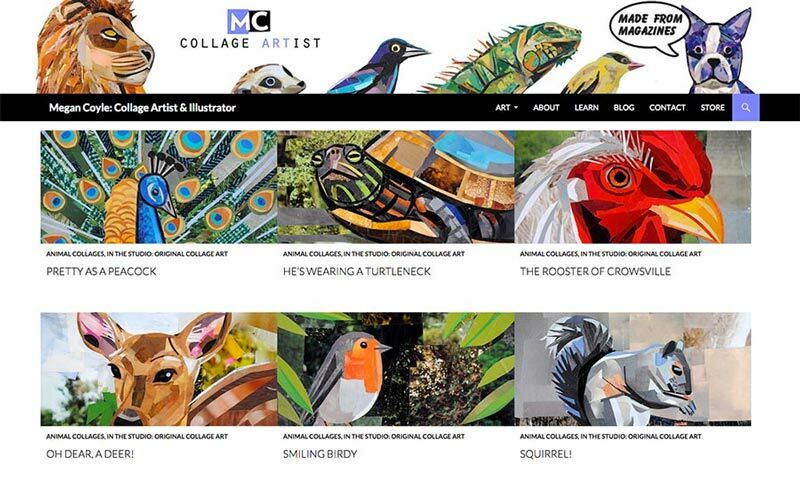 I even added an online store for purchasing my work directly from the site, to make things easier for users. I also redesigned the logo so it wouldn’t emphasize my collage work as much, which would open my work up to other mediums. My site has come a long way. I’m proud that I’ve taught myself a number of things while going through the process of building it – such as learning about coding, web design, user experience design, and content creation. I’m so thankful that it’s easy to share artwork online – and by having a web presence, I’m able to reach people I never thought I’d be able to reach before. I’ve found a lot of inspiration from the National Zoo in Washington, D.C. Over the years, I’ve visited the zoo numerous times, and have taken lots of pictures of the animals in their different exhibits. I thought I’d share some images of the work I’ve made that was specifically inspired by some of the animals found at the National Zoo. I’m fascinated by lemurs, and think that the red ruffed lemur is a beautiful creature with colorful fur and bright eyes. When I was walking by the exhibit where this particular lemur lives, I just had to take a few pictures which later inspired this piece. Pandas are a lot of fun to collage. 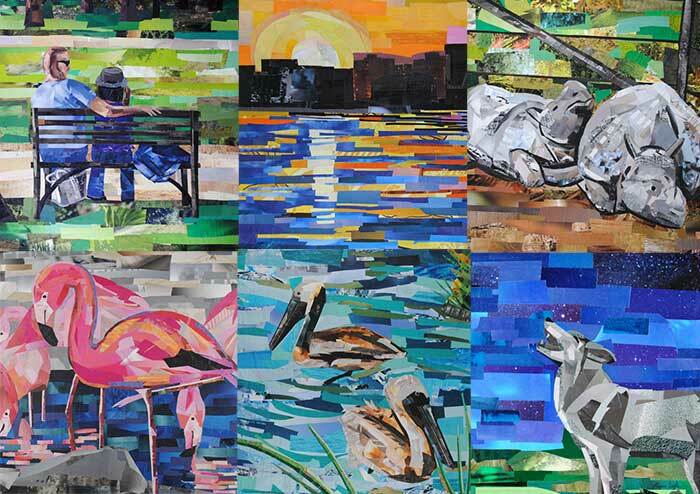 This collage was inspired by feeding time for the pandas, where one of the pandas was so engrossed with eating bamboo. 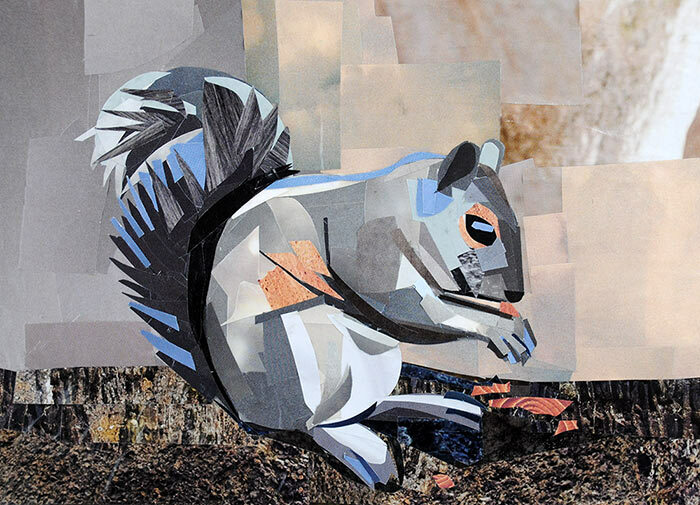 This collage was inspired by a day when one of the red pandas was pretty active, climbing around his or her home. Meerkats are one of my favorite animals. During one of my zoo visits, several of the meerkats were clumped together and looked like they were all cuddling with each other. I just had to take several pictures of them and use those images as references for this collage. “What Are You Looking At?” (Orangutan). It’s eerie how much orangutans look like people to me. They’re so expressive, and it seems like half the time I see them at the zoo, it’s difficult to tell who is really watching who. During another zoo visit, I noticed a turtle that had an unusually long neck, and it reminded me of giraffes. From the turtle’s unusual appearance, I was inspired to make a piece modeled after that species. I love how colorful flamingos are, and I always enjoy taking pictures of them to use as references for future works of art. I suppose I’m really drawn to their vivid pink feathers. I think otters are adorable and I always get excited when I see them at the zoo. 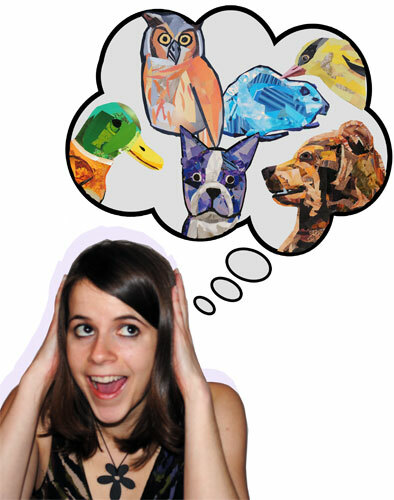 Animals are definitely one of my favorite subjects to collage. I love how they come in so many shapes, sizes, and colors. And I really appreciate that Washington, D.C. has a zoo that is so easily accessible to the public. Being able to visit the zoo frequently, makes it a lot easier for me to tackle my animal compositions. I grew up in Northern Virginia, so I’ve become pretty familiar with the Washington, D.C. area over the years. And as I’ve grown to love different buildings and places, I’ve also found a lot of inspiration from my surroundings. The Torpedo Factory is an art center in Old Town, Alexandria. As a kid, I used to take a number of art classes there. In high school, I was mentored by a painter that had a studio there. And after college, I became a visiting artist for a couple of months over the summer. 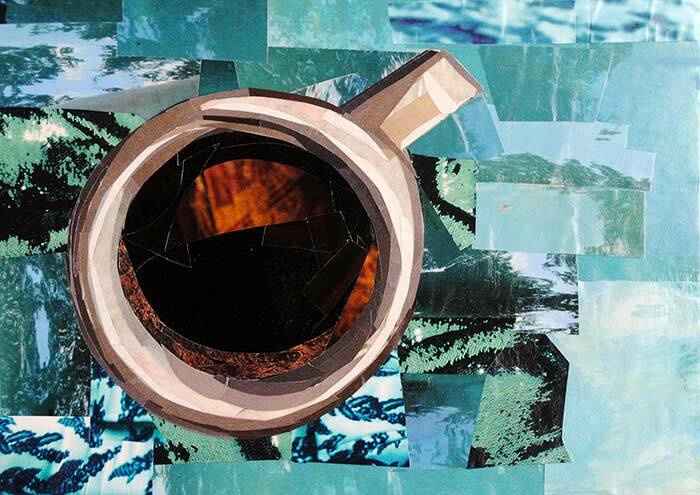 So over the years, the Torpedo Factory has had a big role in my development as an artist – it’s no wonder that I was inspired to make a collage of it. 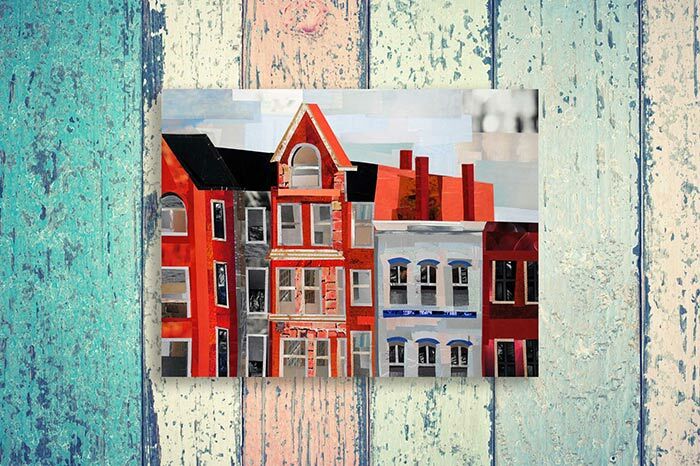 “Downtown Shopping” was inspired by the townhouses in Old Town, Alexandria. Growing up, I used to wander around Old Town, and I became really familiar with the bright and colorful townhouses that line the streets. Whenever I walk by the Tidal Basin, the paddle boaters remind me of the days when I was a kid and went on field trips around the city, or visited museums with my family. “The U.S. Capitol by Night” was inspired by one of the iconic buildings in the D.C. area. It reminds me of the times I’ve lived in the city, or walked along the National Mall. The “Air Force Memorial” is a collage of one of my favorite memorials in the city. I love how the Air Force Memorial is abstract and sculptural. The fact that it doesn’t look like so many of the other more traditional memorials or sculptures, is what really draws me to it. I’ve made a couple of pieces inspired by this distinct landmark. The colorful glass sculptures outside the Botanic Garden have always caught my eye when walking past that building over the years. I like how they give the landscape a pop of color in an otherwise gray environment. I spent a lot of time at the Air and Space Museum back when I was in elementary school. I actually spent a summer going to space camp there, and always had somewhat of a fascination with space. It seemed only fitting to make a collage inspired by a place where I went on many school field trips and summertime outings. One of my favorite memories of art when I was a kid, was when I got to see a Vincent van Gogh exhibit at the National Gallery. I’ve been inspired by van Gogh’s work ever since I was in the second grade and did a school project on him. Over the years, I’ve continued to stop by this gallery to admire their permanent collection or check out the latest exhibit. I’m pretty grateful that I live in an area where museums like the National Gallery are free to the public. It makes it a lot easier to frequent the museum, and to continue to gather inspiration from artists throughout history. When it comes the Washington, D.C. architecture, the National Museum of the American Indian is by far my favorite building. I love how different it is when compared to the more traditional buildings in the surrounding area. 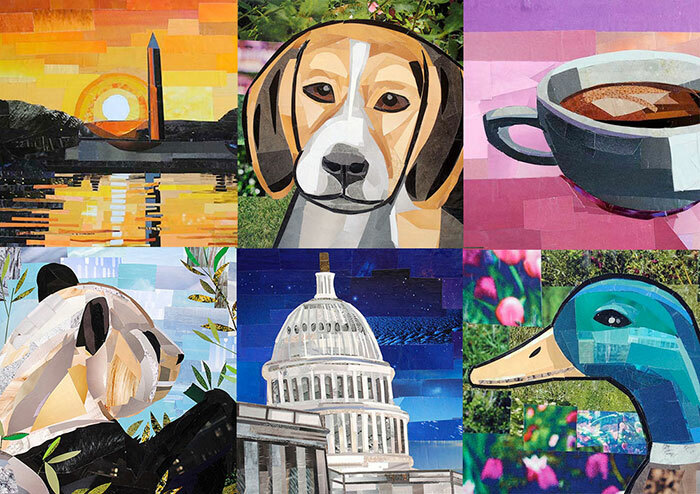 Over the years, I’ve made a number of collages of the Washington Monument. And I’ve also taken numerous photos of it whenever I’ve strolled by. The landscape of the Washington, D.C. area reminds me of a number of experiences I’ve had while living here. 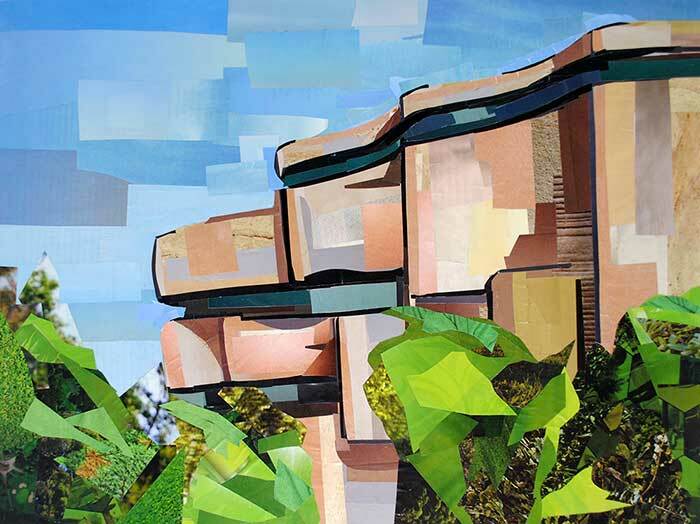 With my collages, I enjoy focusing on these familiar places, and showing a them in a different way – in paper form. I’ve been making art for as long as I can remember. I guess you could say that first I learned to walk, then I learned to draw. When I was in preschool, I spent an unusual amount of time in front of an easel. During grade school, I took after school pottery classes and other artsy classes, like bookbinding and drawing comics. In college, I continued to make art in my free time until I decided to major in it. And now, I can’t go a week without working on something. But why collage? I’ve been making collages since high school, and over the years my style and technique have shifted. There’s just something about collage that makes me come back to it year after year. With collage, I like how I’m constantly surprised with what I’m making. I especially like the medium because I’m working with found materials. And since I’m not mixing my own colors, and I’m relying entirely on what colors I can find in other images, I’m never quite sure how a piece will turn out. It’s always a surprise. 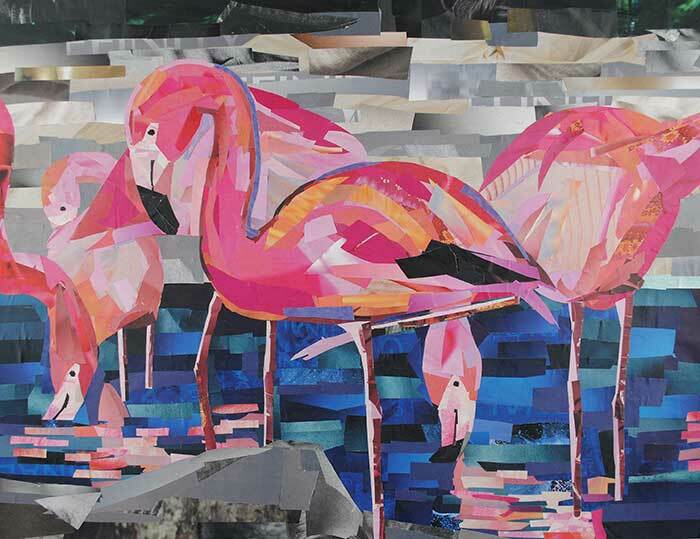 There’s also something therapeutic with the repetitive motions involved with constructing a collage – paging through magazines, cutting and pasting paper. I’m drawn to how these motions help me relax and escape from the stresses of life. And for a moment, I can stare at something other than a computer screen. Back when I was first learning how to paint, I was taught to look at objects as being constructed of different shapes. With collage, I can actually cut out those shapes. Thus it makes it easier for my process as an artist, when it comes to visualizing my compositions. Lastly, I am constantly amazed by artwork that challenges the limitations of different mediums. I love art that looks like it was made from one medium, when it was actually made by something entirely different. 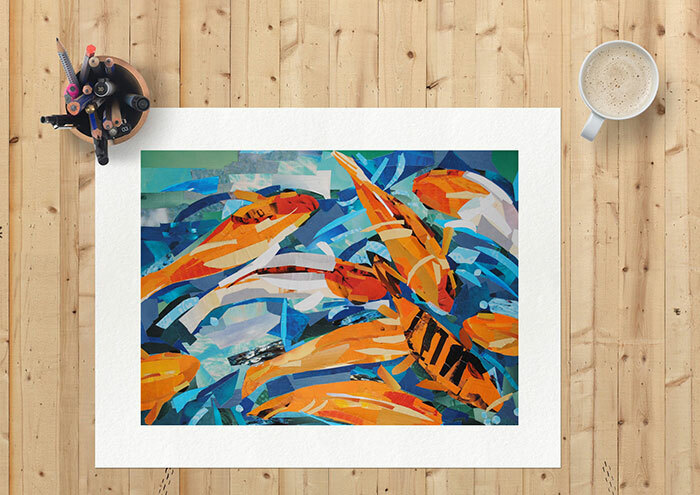 That’s why with my artwork, I like to manipulate paper in such a way that it mimics the brush strokes in a painting. Collage is a medium that I’ve worked in for years. I’m drawn to how it surprises me, and how flexible it is – I can easily layer paper and pull up previous layers. And when it comes down to it, collage brings me joy, and I’m trying to do more things that bring me joy these days. People often think I’m a full-time visual artist, although I’m actually a full-time web developer who makes artwork part-time. I still consider myself a full-time artist in a sense, since my day job involves the art of developing and building applications and websites. Instead of using scissors and paper for my tools, I’m using different pieces of code, and thus creating what you could almost call a digital collage. Regardless of what tools I’m using, I’m still able to satisfy that inherent drive I have to make things. I am able to live the creative life full-time – whether it’s code I’m writing or collages I’m constructing. I like to tell people that I’m a code artist by day, and a fine artist by night. And I like how these two worlds of mine inspire each other. 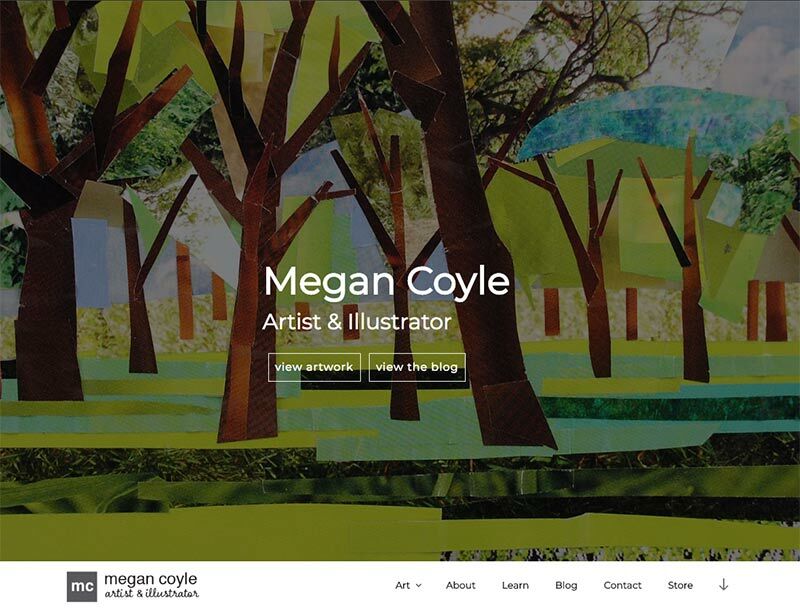 I first got started with working on websites because of my artwork. 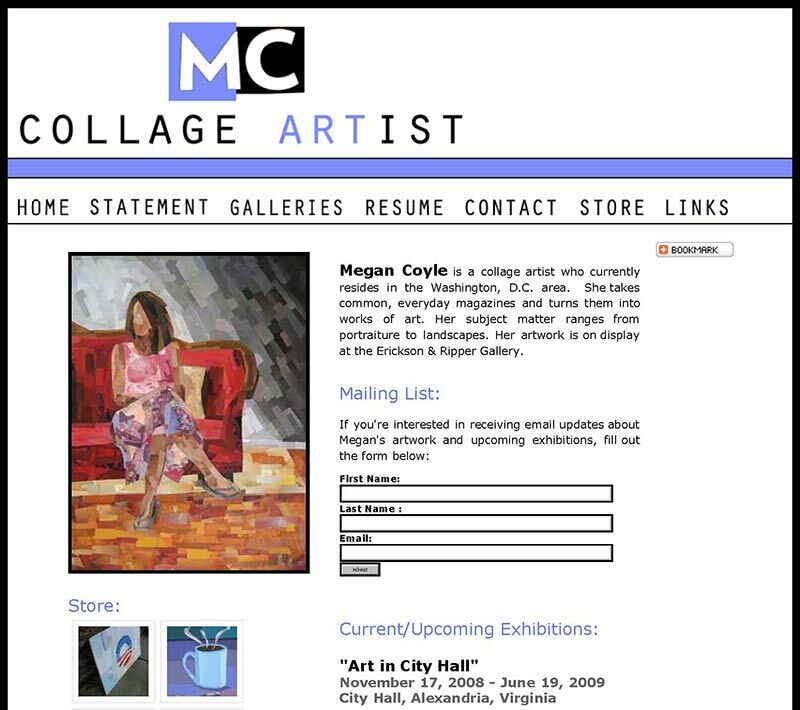 Back in college when I was studying painting, I took a class where one of our projects was to create an online portfolio. 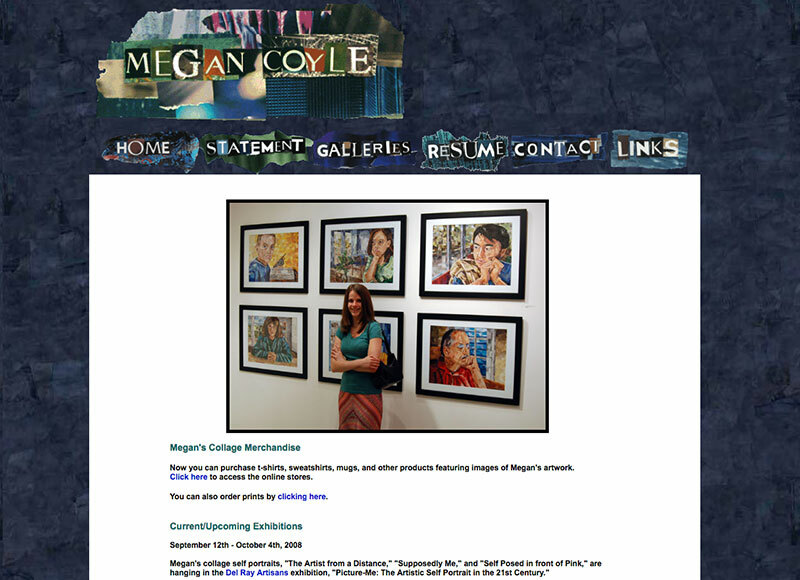 The first version of my site was pretty terrible, but I was so proud that I made a functional website all on my own. I managed to teach myself enough about coding to create and deploy a website – and that’s what got me hooked with web development. Over the years, I’ve continued to grow as a developer. 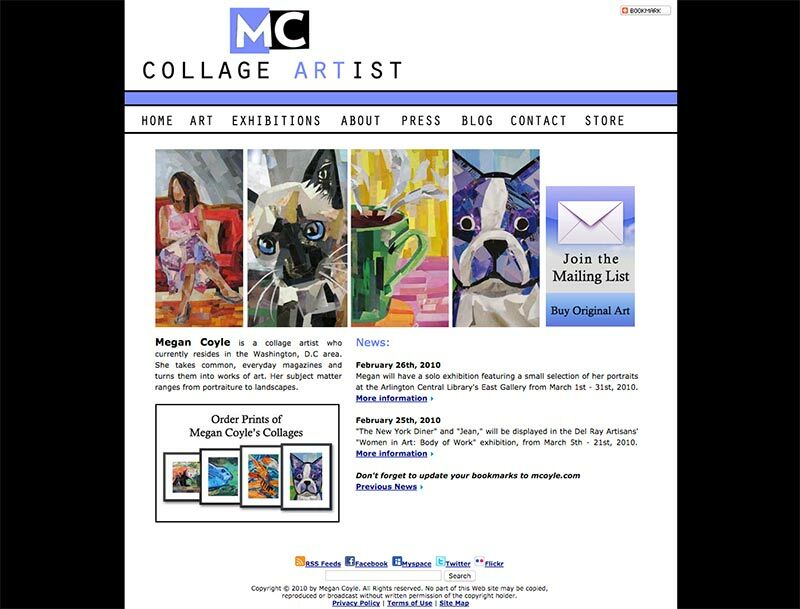 The direction of my art career often inspires changes on my portfolio site, such as updating the overall layout or adding an online store. And sometimes the coding I do for my art website inspires the coding I do for my day job. Other times I’ll make something at work that inspires the direction of my portfolio site. As a web developer, I’m able to tackle problems with my web presence as a fine artist and come up with creative solutions. 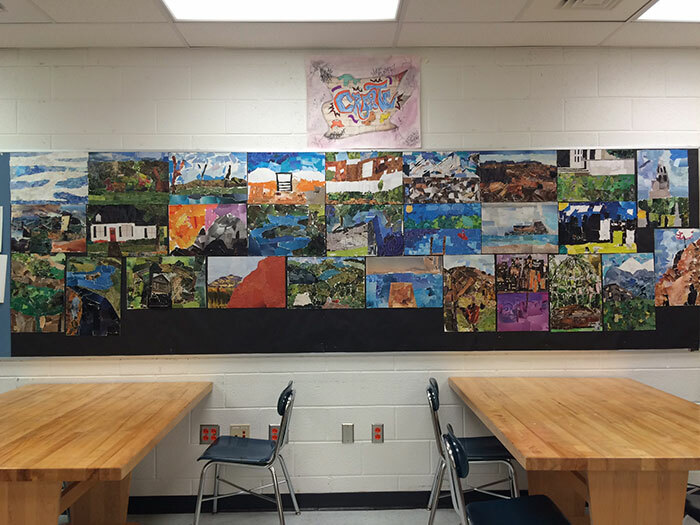 When my site was fairly new, I noticed that I kept hearing from students and teachers who wanted to learn more about my work. So I came up with the idea to make things easier for them by developing an education section for my website. The section includes information about my process, as well as online lesson plans to help teachers teach my technique in class. As a result of launching this section, I started hearing from more and more classes around the world. When people hear that I’m a full-time web developer, they often ask if I want to some day become a full-time visual artist. I always answer “no,” because I enjoy the variety in my work. I like how I’m able to live the creative life with two fields that inspire my work in both areas. I’m happy that I’m able to challenge myself creatively in a number of ways, and because of that, I wouldn’t change a thing. I’ve been told that as a kid, I used to draw an abnormal amount. I’d spend hours with coloring books or craft projects, like making my own paper dolls. When art stopped being a hobby for me and became a part of my daily routine, I noticed a pattern – some people shot down my dreams of becoming a professional artist almost immediately. And this pattern continued. Later on I decided to pick up art as a second major in college, and started exhibiting my work in galleries after I graduated. Even then I remember hearing the phrase, “it’s difficult making a living as an artist.” Or sometimes, “not many artists can make it big.” And although I had a wonderful support network of friends and family who encouraged my artistic endeavors, I kept having run-ins with people who were trying to dissuade me from the creative life. So why do so many people feel the need to discourage the artistic lifestyle? Is being an artist really as tough as some people say it is? Well, being an artist is difficult and so are a lot of other careers. As an artist, you’re essentially running your own business, and being an entrepreneur is a lot of work. But that doesn’t mean it’s impossible and that there aren’t people out there who live and work as full-time artists. For whatever reason, our society likes to feed the idea that art isn’t important, that it’s valued less than math or science. Society tells us this in a variety of ways – let it be the starving artist stereotype or how funding for the arts is usually one of the first things gutted whenever money gets tight. Cultivating this type of thinking gives birth to art naysayers. Or should I call them art un-enthusiasts? So the next time someone tries to discourage you from your artistic dreams and goals, just remember, you can do anything as long as you set your mind to it. If it’s your dream and passion, then you’ll make it happen. When faced with setbacks and failure, you should never give up – you should pivot or rethink your approach, but never give up. Success happens when you persist. As for all the naysayers you run into along the way? I say you use them for motivation to work even harder, so that you can one day prove them all wrong. I get asked this question a lot, and every time I hear it, I’m always surprised it was ever asked in the first place. I guess it’s hard for non-artists to understand what I mean, and to understand what fuels me to live the creative life. I’m an artist because I need to be one – I have this inherent drive to make things. It pulses through my veins, and makes me fiercely resistant to the thought of ever giving up the artist title. When you’ve been making art every week of your life for years, the process of art making gets ingrained in your mind. What may have started as a hobby, or something that was “just for fun,” blossoms into something you can’t live without. It becomes a habit through repetition, and when you finally go without it for a few days, you feel like something is missing from your life – the pangs of art withdrawal. It’s moments like those when I realize I can’t live without being an artist in one form or another. Being an artist is what gives me purpose in life. Art has also been one of the few constants in my life. Even when times have been tough, like grieving the loss of a loved one or coping with the pain of a broken heart, art has been around for me. During those times, art has not only been a creative outlet, but also a form of therapy that helps me through the days when it’s difficult to stay afloat. I guess you could say that when life gets messy, making artwork is one of the few things that makes sense amid the chaos. When I was growing up, art had a major role in my life, which is why it makes complete sense that it still does. As a kid, I took art classes at local galleries and whenever it was possible at school. I remember back in high school, it didn’t matter how stressed out I was from my other classes, because I could always count on feeling a great sense of relief when I went to art class. I could momentarily forget all my other worries as I focused on drawing or painting. Although I went to college for creative writing, I quickly realized that visual art needed to have an active role in my life every year, so I picked up a second major in painting. It was at that time that I realized something – that no matter what criticism I received for my visual art, I was always able to bounce back. Rejection is a pretty tough thing to overcome when it comes to an artist’s work, simply because we are putting ourselves out there when we share our art. And even during the worst critiques, when I felt incredibly sad and didn’t know if I should continue making artwork at all, I’d find myself painting in my room late at night and realize it was meant to be. As an artist, you would think rejection is something I get used to since it happens often enough in an artist’s career. Although for whatever reason, whenever a gallery has rejected my work, I still find myself wondering if there is any point in continuing to make art. I’m glad that I’ve never given up entirely because of the opinion of a handful of people. No matter what, I’m still drawn to creating something, let it be a collage, drawing, or painting. So whenever I’m asked why I’m an artist, all I can think is it’s not something I choose to do – it’s something I have to do. I’m an artist because making artwork is what drives me through each day. On July 6th I got to experience my first live radio interview. I was definitely a bit nervous about going on a show where I had no idea what questions I would get asked. I suppose I have a tendency of liking the process of being overly prepared and have something already rehearsed and ready to go. And I have to admit, I didn’t tell anyone when I was going on the air since I wasn’t sure how it would pan out. Nevertheless, it was a great experience and I’m glad I did it. I was on Toginet.com’s live broadcast of Creative Mojo with Mark Lipinski, a show dedicated to the modern crafter and crafting lifestyle. 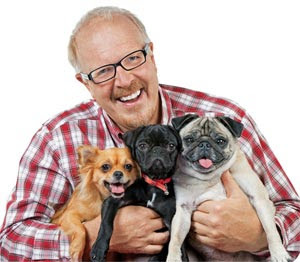 Mark was a pretty hilarious interviewer – can’t you just tell from this fabulous photo of him?